Great help to my husband. I bought this for my 81-year old mother. She has severe Rheumatoid Arthritis and a degenerative disk disease affecting her neck. Ten years ago, she underwent spinal surgery to remove a benign cyst in her spinal chord leaving her numb in her bottom area. Mom said the BedCane was a gift from heaven. The BedCane makes it so much easier for her to get in and out of bed. It's easy to put under the mattress (and strap in) and is not obtrusive. Mom wishes I had bought it for her ten years ago after she had her surgery! So do I. Thanks so much from both mother and daughter! My husband is ten years post-stroke and lives in an assisted living home. Having the BedCane has allowed him to transfer from his bed to wheelchair with assistance from the staff. Without the BedCane we might need to consider moving him to a nursing home. My elderly mother uses one as well and she also strongly endorses it. Help getting in & out of bed! This helps my husband get into and out of bed. Without it, I would have to assist him every time he wanted to get up. We have been very pleased with such a simple device. A great help for me to get in and out of bed without help from others. Has a nice pocket to hold my crossword and my tv remote. How does this connect to the bed? Check the manufacturers website - standers.com for pictures and video. 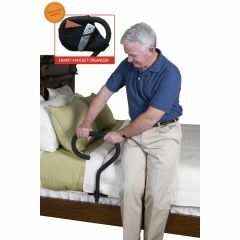 Cane attaches to a wood board that goes between frame and mattress and has a strap also.